Zensah Athletes Looking to Go to Rio Range from Long and High Jumpers to Hurdlers. We are thrilled that Zensah® will have more athletes competing for a trip to Rio than ever before. Zensah®, the premium athletic apparel brand, announced today that several athletes including Garrett Huyler, Norris Frederick, and Jarret Eaton will represent Zensah® at the 2016 U.S. Olympic Team Trials for Track and Field at historic Hayward Field in Eugene, OR taking place from July 1-10. 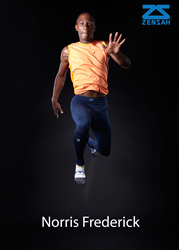 Some of the athletes competing for Zensah® and wearing Zensah® compression products include NCAA All-American Long Jumper Norris Frederick, High Jumper Garrett Huyler, and Hurdler Jarret Eaton. Zensah® compression socks, recovery compression tights, and other compression products, combined with hard work, played a pivotal role in helping these athletes prepare for the Olympic trials. Zensah’s unique compression technology helps athletes perform better and recover faster. About Zensah: Zensah® is a Miami-based company specializing in sports compression apparel. Their products are used by Olympians, professionals, and amateurs alike. Zensah’s unique knitting technology combined with premium raw materials work together to create premium compression technology. Zensah® compression products can be found in specialty stores around the globe.